Align4NCWorks promotes a more responsive and aligned workforce development system by strengthening partnerships among community colleges, business/industry, workforce development boards, public schools and economic development. North Carolina will be a global leader in the number of students leaving its community college system with a job-ready credential that can lead to becoming a successful employee or employer in a global economy and provide for better skills, better jobs, better pay and continued educational attainment. Goal 1: Increase and sustain employer engagement as part of an integrated, customer-centered workforce system. Goal 2: Connect students to quality careers and employers to quality employees. Goal 3: Ensure education and training address and validate skill and competency needs and attainment. Goal 4: Expand work-based learning opportunities. Goal 5: Improve career awareness and mapping. Goal 6: Increase opportunities for college access while keeping education and training affordable. Goal 7: Promote demand-driven and data-informed decision making and evaluation to more effectively meet workforce customer needs and enhance system accountability. Goal 8: Strengthen the foundations of success for workforce development. A "Made in Robeson County" video spearheaded by area businesses with community college and other workforce development partners is dispelling myths youths hold about the manufacturing industry and manufacturing jobs. The video was shared with about 600 high school parents in February 2016, along with a discussion of technical careers in the area and available scholarships for relevant education and training. 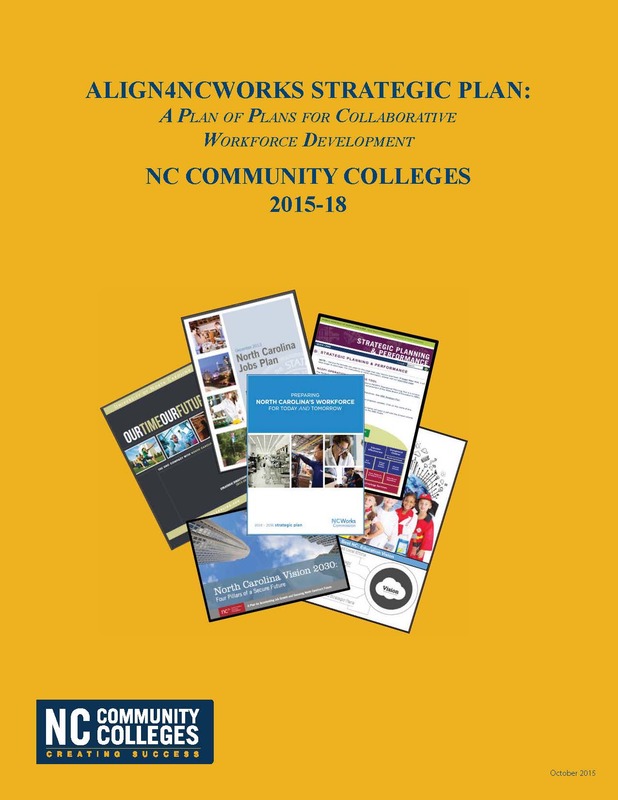 As the first step in the Align4NCWorks process, the NC Community College System turned to the state’s 58 community colleges and their local partners to spotlight workforce innovations and discuss challenges. Community colleges hosted regional Workforce Learning Summits involving partners from business and industry, public schools, workforce development boards and career centers, and economic development. Elected officials, local government leaders, community organizations and other partners also participated. View a table and summaries of innovations.